Perennials and annuals must be grown in an area of the garden that meets their requirements for sun, moisture, nutrients, drainage and air circulation. Take these requirements into consideration when planning your planting locations, as well as the labor which it will take to make the area usable. Keep in mind that the more effort you put forth toward your gardening, the more you will be rewarded. You don't have to follow every step to the letter, especially when you are dealing with an established planting area. This guide begins with a nasty, bear of a spot to work with, and will show you what I feel is the best method for creating a new garden from scratch. The area that I chose to work over, had never been cultivated other than to prepare 'quicky' holes to plant the Rhubarb in when they had to be moved from another garden. The roots of Blackberry vines and Salmon Berries were happily thriving beneath the surface, ready to do battle with me. 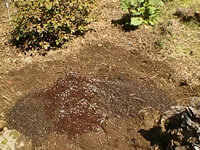 The soil has a reasonably high amount of organic matter from years of decaying leaves dropped by maples and alders. There are lots of BIG rocks laying about a foot below the surface. The blackberries were cut away and the surface weeds were removed. Then I began the task of 'double digging' the entire area, removing roots and rocks as I went. I divided the garden into four sections and concentrated on each one individually, but eventually dug the entire garden area. Double digging consists of digging a trench the entire width of your garden (or section of...) to a depth of two shovels. The removed soil is set off to the side. Then you dig another trench adjoining the first one, but this time you toss the soil into the original ditch. Continue digging, and moving the soil, until you reach the other end of the garden. 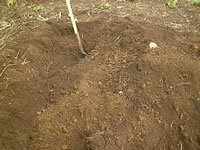 Place the soil from the first trench into the last, and you are done with this step. As each section was completed compost, ground bark, and granular 'all-purpose' fertilizer (5-10-10) was added and thoroughly mixed into the garden soil. The fertilizer was added sparingly at a rate of a cup per square yard, even though many parts of the garden would not be planted. Bark was added to provide structure to the soil because of the clay content. Each of the four sections got a half bag of bark. Two wheelbarrows of compost were added to each section, to feed the plants naturally, and utilize a great, free gardening resource. 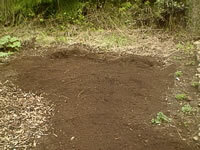 After the soil was double dug, prepared and mixed, it was leveled out with a steel garden rake. Pathways and areas which wouldn't be used for plantings were covered with a mulch of wood chips which was kindly donated by the local utility. Wood chips consume and burn nitrogen from the soil as they compost. This is the reason I added the fertilizer to the entire garden, rather than just the planting areas. The rocks which were removed from this area will be used for small rock walls, a new rock garden, and as garden accents, here and there. By properly preparing the planting area, the roots of your new plants will adjust and begin to grow more rapidly and deeper. 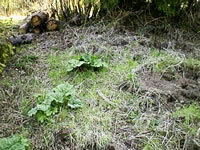 This, along with mulching helps to reduce the need for frequent watering. Gardening 101: Garden Basics.. zone maps, charts, guides and more.